Marist High School students load a case manager's car with gifts purchased by students. 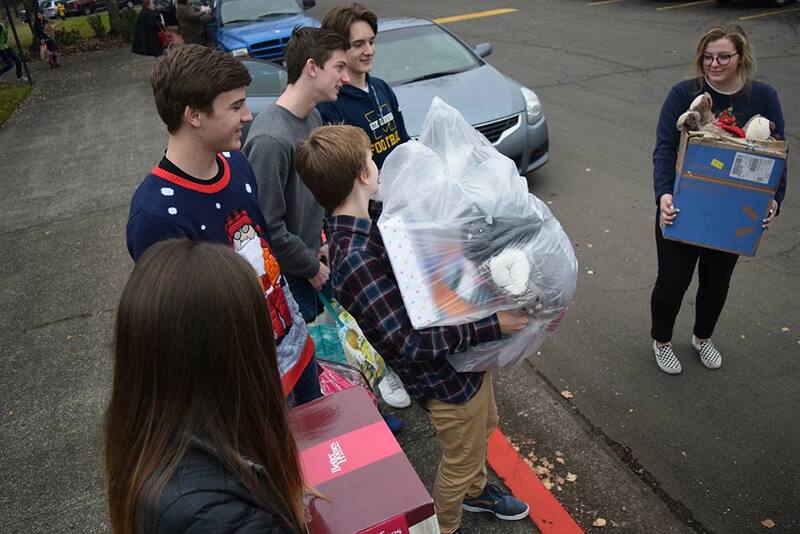 Marist High School is one of many partners who provided Christmas presents for Lane County families in need. (Courtesy Catholic Community Services) ? SPRINGFIELD – Many families in Lane County will have a bright 2017 holiday season because of the Christmas Giving Program, organized by Catholic Community Services of Lane County. The program, an ongoing tradition, matched 77 Lane County families in need with gifts from sponsors, including local businesses, households, and parishes. The Christmas Giving Program provides Christmas gifts for families currently being assisted by CCS Self-Supporting Families programs. The programs focus on finding affordable housing, educating fathers to become successful parents and strengthening families. Families in the programs often are going through hard times. “The commitment made by our local partners to sponsor families at Christmastime helps to provide special holiday memories and has a concrete and positive psychological impact on parents and children during this blessed time of year,” said a statement from Catholic Community Services.